It's beginning to feel a bit like Christmas ... over here at Talk-a-Lot Towers. We've got all our Christmas decorations down from the attic, and we're busy putting them up. 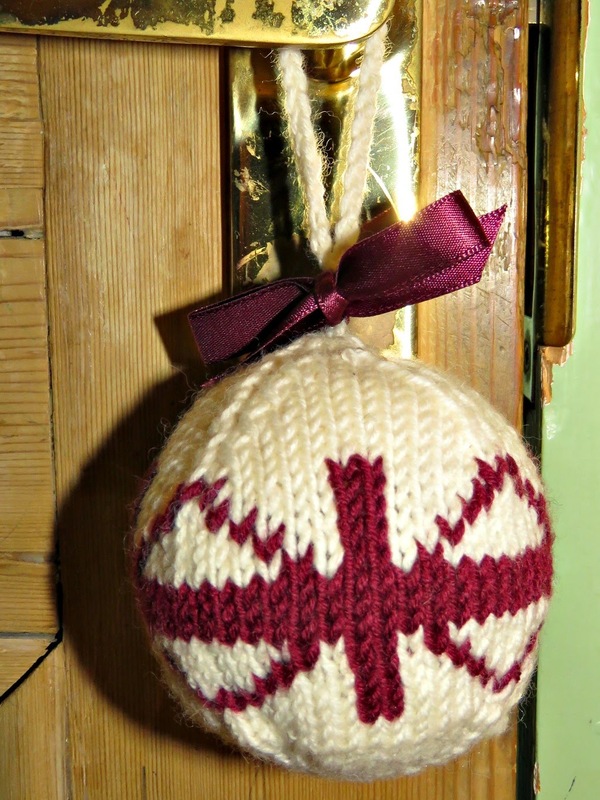 Yesterday as I was waiting for my Christmas mincemeat to cook I had a go at knitting my first Christmas ball to go on the tree. It's kind of cute and retro, don't you think? I'd had a vague idea of what I was going to make, and I'd gone down to Bunty's, my lovely local wool shop, and asked for some wool that would match the Christmas ribbon that I'd used to trim the dried orange slice decorations and the cinnamon stick decorations that I'd made for the tree last week. I don't want it to look too matchy matchy but I think that the ribbon will tie everything together without hitting a jarring note. Anyway, I found some Debbie Bliss Cashmerino in colour number 340037 (which is the dark red/ burgundy) and some Peter Pan Merino Baby in colour number 3031 (which is the lovely cream colour). They both knitted up on size 3 needles. I thought they ought to work pretty well together, so I brought them home for the project. 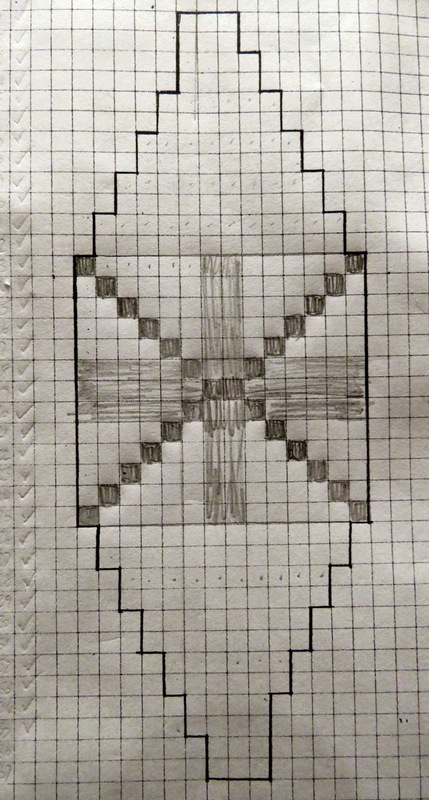 Each square represents a stitch. 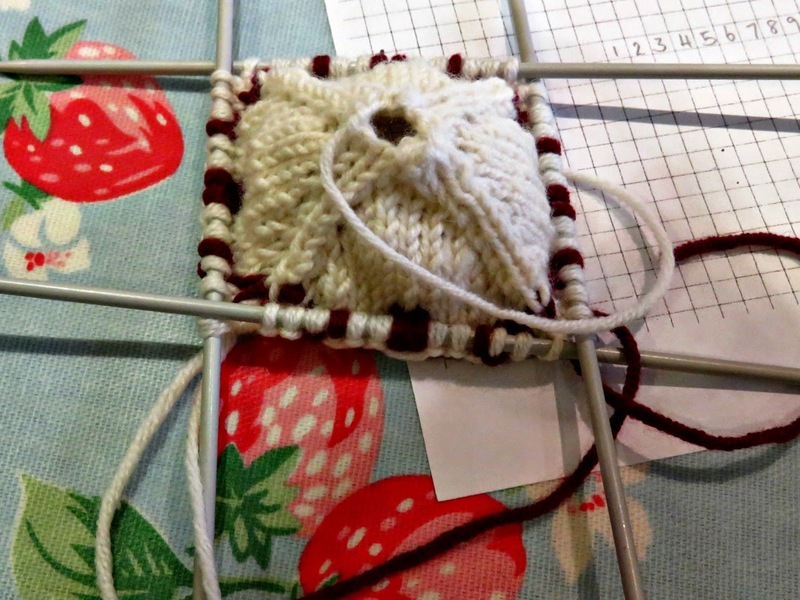 The squares that are white are knit in the cream wool and the ones that I've coloured in with pencil are knit in the red wool. 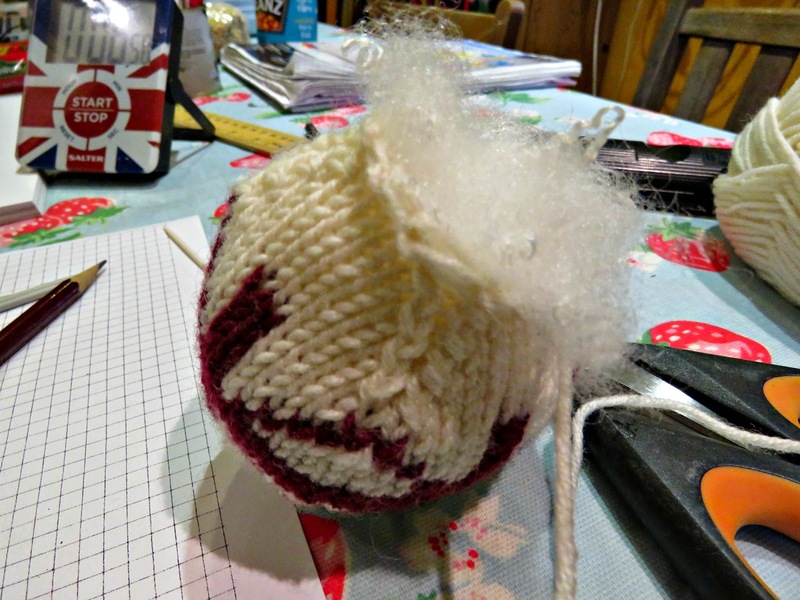 You can see a line of ticks down one side where I've ticked each row off as I've knit it. 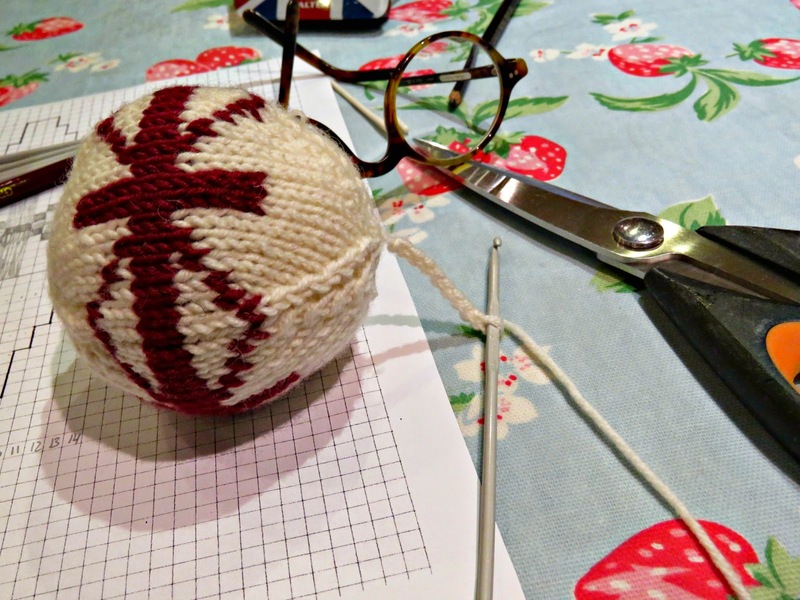 The first thing you need to do is cast on 12 stitches, and divide them between the four active needles. Knit the first round, joining the circle, and being careful to keep the joining stitches on each corner reasonably tight so that you have even tension. The second row is just plain knit stitches as well. On the third round you need to add one stitch at the end of each needle, by knitting into the connection loop from the previous stitch. Remember that the pattern above applies to each of your four needles. The left hand side (looking at the paper) is the start of the row on the needle, and the right hand side is the end. Now just keep going, following the pattern above. When you're finished cut the wool, leaving enough to crochet a chain to fix it to the tree. 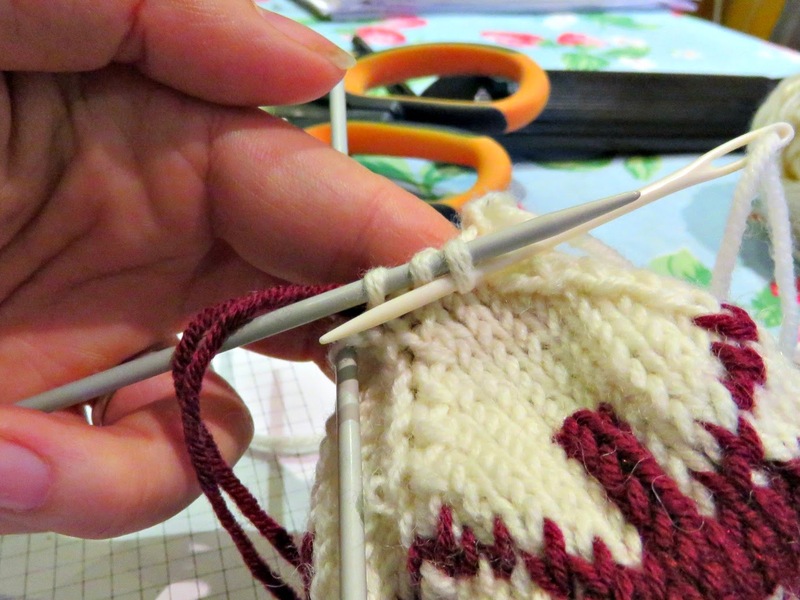 Draw the wool through the remaining 12 stitches on your needles, but don't pull it tight. Darn the small aperture shut at the opposite end of the ball, where you started. Turn the ball inside out, and secure and darn in any loose ends. 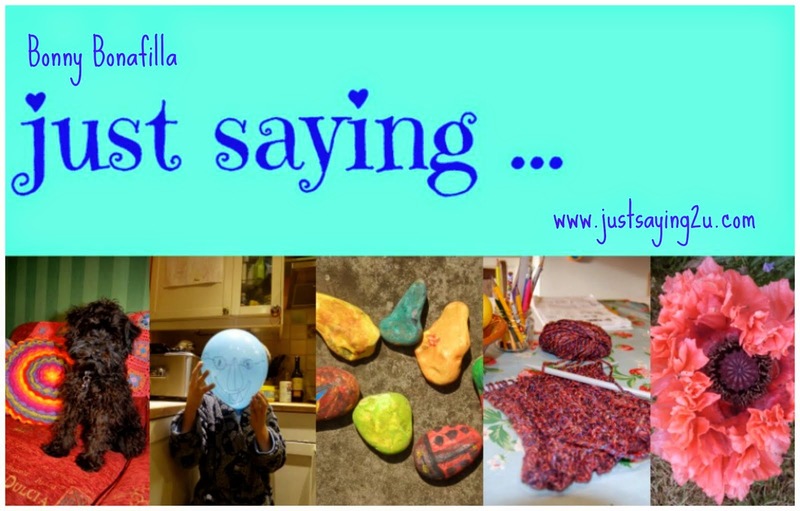 Gently, using a little stuffing at a time, stuff the ball with filling. I used a soft toy filling. 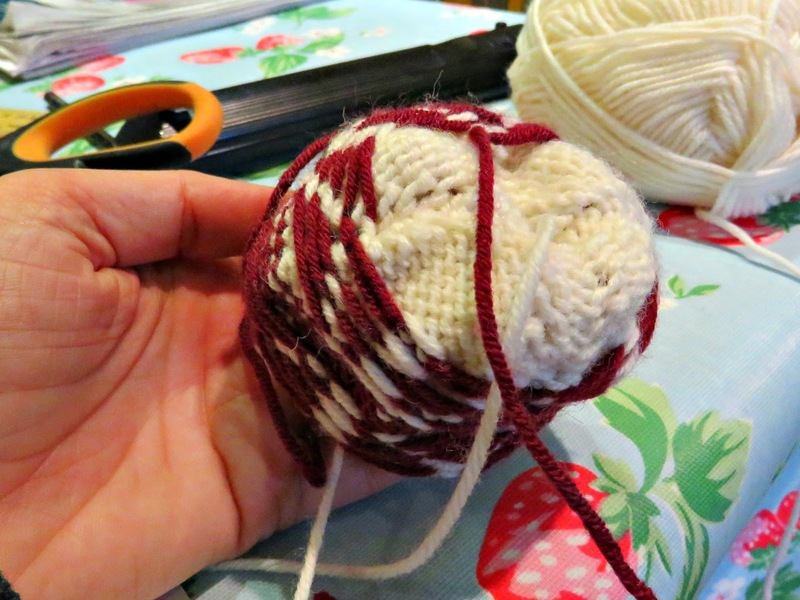 When you've got enough filling in the ball to make it plump, but not too stretched, draw the wool tight through those last 12 stitches to close the opening and secure it with a few darning stitches. Crochet a simple chain with the wool that remains and fix it with a darning needle to make a loop that you can hang over the branch of your Christmas tree. I finished mine off with a bow that I thought would match the Dried Orange Slice Decorations and the Cinnamon Stick Decorations that I've already made for my tree. And that's it! Ta-dah! 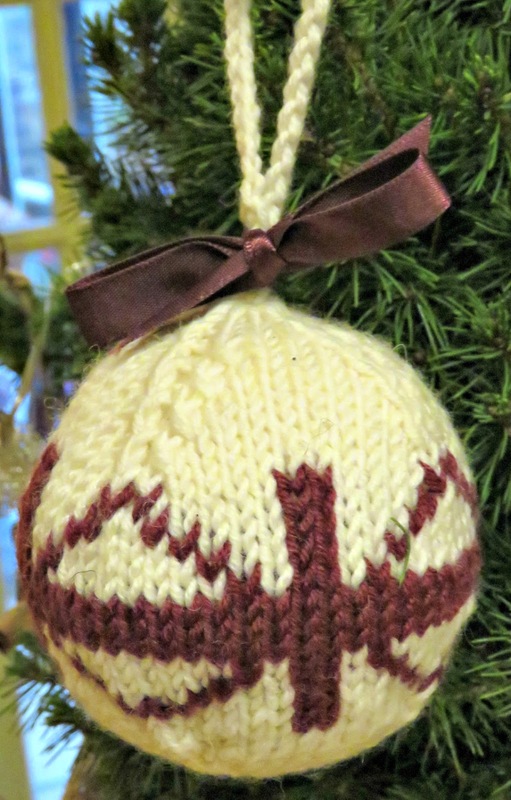 You've made a Christmas ball for your tree.